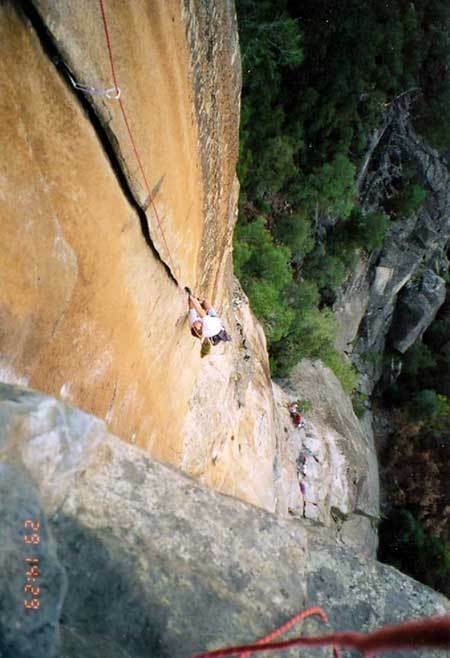 Having started my rock climbing career relatively late in life, and starting it out from the backwaters of far western Washington, my first few trips to Yosemite as a climber were you might say cautious. 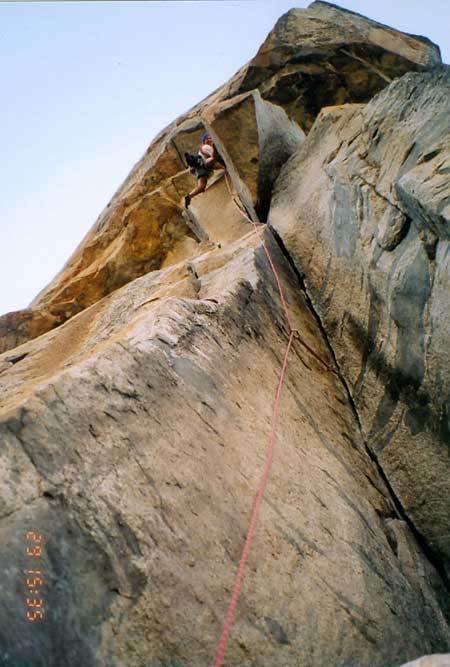 Lacking the magnetic charisma, the looks, and the climbing skills to attract a partner that made easy work of the classics, I bumbled along and eventually by the end of my second trip had transformed myself into a crack climber of modest ability, onsighting even a few 5.10 b and c climbs. After I had just led Stone Groove up at Reed's one fine fall day, a good looking blond gal and her companion a tanned muscular fellow with a pony tail came up to do a few laps on some classics. The gal I recognize from some Greg Epperson photos of her on Midterm as the taco stands own Jobee, and Bob I had seen a very nice shot of him leading the Twilight Zone in a glossy book somewhere. Needless to say they both do Stone Groove so easily that I wonder why I found it so challenging. We hang out and chat while taking turns running laps on Stone Groove and Bob and I make plans to climb down at Arch Rock the next day. 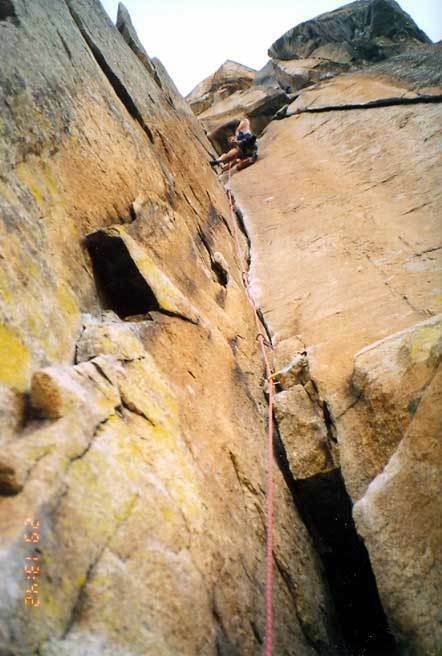 The next day I meet with Bob down at Arch hoping to give my learning curve a big jump, since I finally latched onto a partner who was clearly a far better climber than I was. We share an olive oil loaded protein drink that he has prepared then head up to the rock. Up at Arch with Bob doing all the leading we climb Entrance Exam, English Breakfast Crack Blotto, Leanie Meanie, and the first pitch of Gripper all in the course of a few hours. I am able to follow these climbs cleanly with the exception of Leanie Meanie where I take a hang 2/3 of the way up the pitch. Based on this performance Bob deems me able to follow him on the Rostrum, I have my doubts but I agree to do it anyway. After all if I wait till I think I'm ready I might never get on the thing. I meet Bob at the Rostrum pullout at about 10 in the morning we share another of his protein concoctions, load up and head down the hill, stash some water and goodies at the mid point ledge, and then rap to the base of the climb. The climb starts mellow being no harder than 5.9 up to a set of chains about 100 feet up. 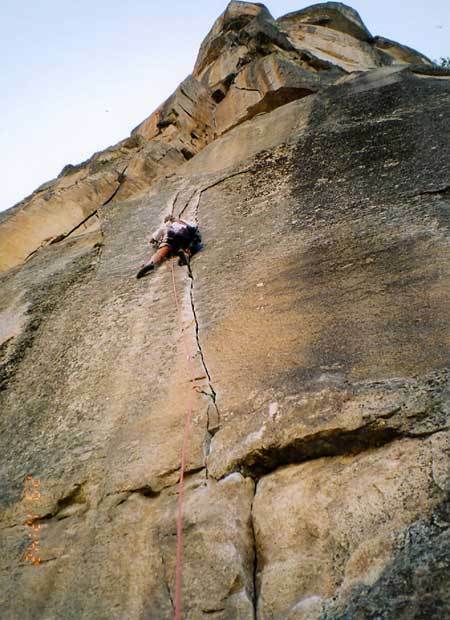 Instead of belaying here and then going left for an 11a pitch like most parties do Bob continues straight up into a 10d flare that sort of looks like a reverse version of pictures I've seen of 10.96. The second pitch follows a stellar hand crack up a corner passing a few roofs, certainly one of the finest pitches I've ever climbed and one of the few pitches on the climb I could comfortably lead. However I'd probably want a little more pro than you see Bob using here. We grab our water and share some snacks on the mid point ledge and continue on. Here Bob leads up pitch four which follows hand to fist crack up a beautiful orange corner. 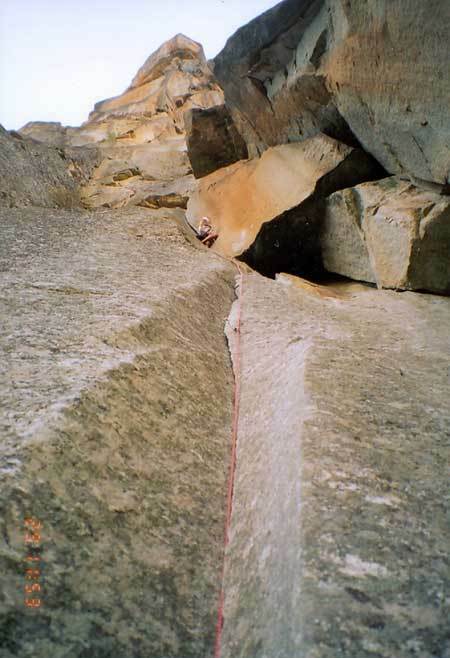 The fifth pitch offwidth goes down without a hitch and we're onto the 11b hand pitch which I manage to free climb, here's Bobs jacket casually tied around the waist laughing and joking making it look like its all of 5.8. This pitch delivers you to a nice perfectly flat ledge underneath the also perfectly flat Rostrum roof a cozy four foot high horizontal slot probably dry in any weather. From here you do a scrunchy little traverse right over nothingness to gain the final 5.9 offwidth with its museum of stuck #5 camalots and long sticks from attempted retrievals in the back of it and forge up it to the summit. Climbing the North Face of the Rostrum truly is the climb of a lifetime and now thanks to you Bob I've gotten to do it twice. Sorry I never caught or more likely have forgotten your last name Bob but if you're still around maybe you can drag me up Astroman next time.